Much like my travails with “Space Quest 6: The Spinal Frontier,” my experiences with GK1 were trying. I played it on an early 1990s IBM PC, running Windows 3.0 or 3.1. Many of the game’s puzzles stumped me, plus its macabre subject-matter was a little much to take in as a 9 year-old just getting acquainted with computer games. There were three games in the original “Gabriel Knight” run. I didn’t play the third one, but enjoyed the radically different designs of the first and second installments. Whereas GK1 was one of the pinnacles of the point-and-click VGA formula that Sierra perfected between 1990 and 1994, the second one, called “The Beast Within,” encapsulated the era of Full Motion Video. It took up a full 6 (!) CDs, at a time when having a game on a single CD-ROM was considered cutting-edge. Sierra’s games may not have been action-packed, but they were frequently on the technical frontier, whether it was FMV in GK2, voice acting in “King’s Quest VI: Heir Today, Gone Tomorrow” (it came out in 1992 and had more lines of dialogue that most films made up to that point), or open worlds in the original “King Quest,” all the way from 1984. Even SQ6 was philosophically ahead of its time, with its look at the early structure of what we now call the Internet. 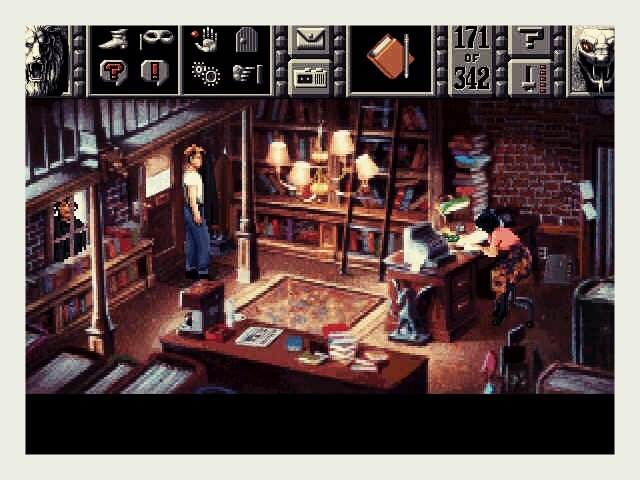 Maybe the best of Sierra’s adventure crop – GK, SQ, KQ, Quest for Glory, Police Quest – were so far ahead of their time that they were waiting all along for the emergence of phones, tablets, and the MacBook Air as their ideal platforms. They were never served well by the hulking gaming PCs of the late 1990s, the rise of which neatly coincided with the decline of the adventure genre, which had no real need for graphical flair or processing power. 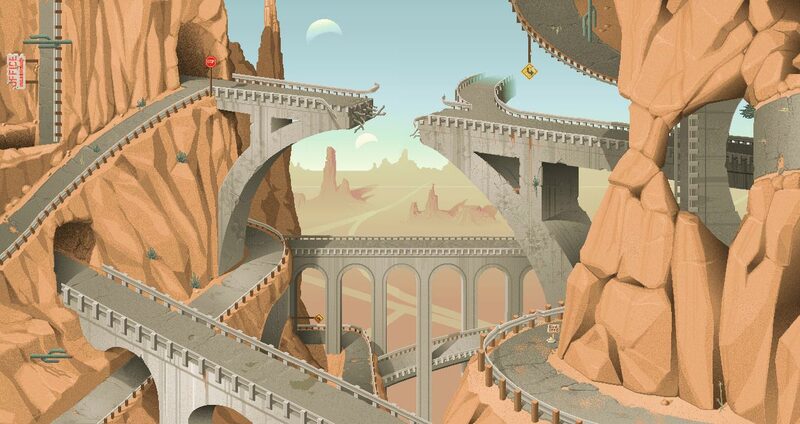 Now that PCs as a whole are in decline and gaming PCs confined to a niche audience – with gaming itself having become radically democratized across many user demographics – it’s a perfect time for adventure games to reemerge, and so they have. The new coat of paint is nice on the eyes, although I still love fuzzy pixelated graphics sometimes. The biggest upgrade is probably to the UI, which is not simplified into just a few primary buttons rather than a crowded task bar. 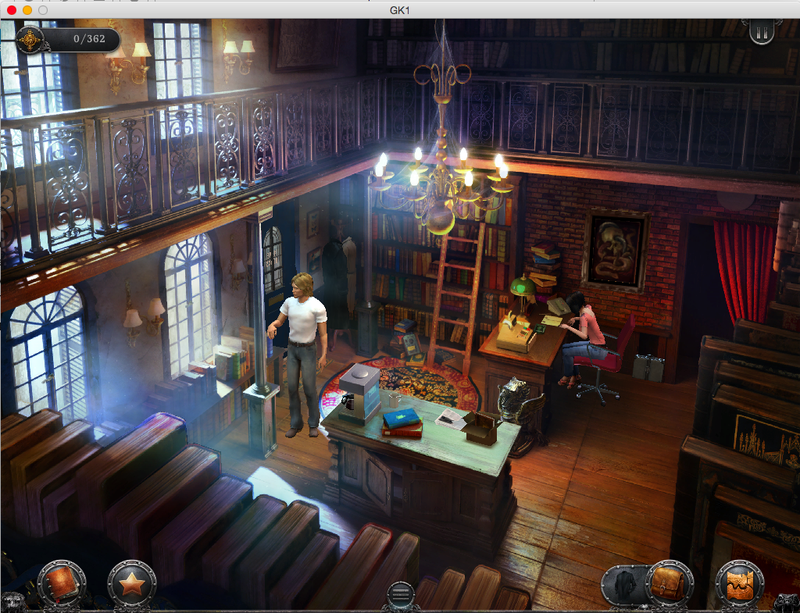 The GK1 revamp is more ambitious than some other adventure game revivals in recent years. The “Broken Sword” games, for example, were mostly faithful in their iOS/Android ports from their 1990s PC originals. But even with the extra content and graphical upgrade, it still runs without a hitch even on a minimum specs MacBook Air that, for context, can’t reliably handle the online trading card game Hearthstone. The titular character encounters a beignet vendor in Jackson Square. The sweet foodstuff itself is an important item in the game, an example of how Sierra game designers often made silly, seemingly insignificant items pivotal (the rotten fish in SQ6, which is used to defeat the final boss, is probably the best example) to the plot. My family visited New Orleans in 1998 and that trip remains the only time I’ve been to the city. We didn’t have time to get a beignet while there, so in ensuing years i’ve settled for versions at Taste of Chicago and various restaurants. My fascination with these fried donuts continues on though, due to a 20+ year-old gaming puzzle that I now get to experience. Replaying the GK1 remake, the game has aged well thanks to this quirky touches of humor, strong writing, and a tuneful and moody soundtrack. Replaying it on my laptop, like replaying Broken Sword II on my Nexus 5 last year, seems natural, since processing power and graphics aren’t what matter or what ever mattered. Gabriel Knight is reborn, beignets in tow. One of the distinctive things about the Internet is that no one used to call it “the Internet.” Throughout much of the 1990s, the act of accessing an IP network (likely over dial-up) was referred to as “going online,” entering “cyberspace,” or encountering “the Net,” “Web,” or just “AOL.” Then there was my favorite: the Information Super Highway. Computer-driven networks had been evolving for decades by the time that Geocities et al made them directly accessible to consumers. There wasn’t a monolithic, unified network in development that whole time, though; “the Internet,” in all of its broad meaning, was a latecomer to the networking, software and hardware party that had been going on since microprocessors were invented in the 1940s. Card-processing networks and travel reservation networks, for instance, were among the disparate networks that emerged throughout the 1970s, as Evgeny Morozov noted in a recent interview. The discursive convergence on the term “Internet” didn’t happen until much later, and was never inevitable. Infrastructure control had to be handed off to the private sector and specific technologies and protocol stacks (like Ethernet and TCP/IP) had to win out over others. These days, the Internet is seen primarily as a medium. One might “use” the Internet in the same way she might use a phone line, magazine, or TV. It serves as a means of getting information, e.g., it has literally become “the media,” in a happy coincidence of terminology. But one doesn’t really occupy it; in the popular imagination, there is no longer a spatial quality to it, and talking about “cyberspace” feels anachronistic. This wasn’t always the case. There was “cyberspace,” sure, but there were also “chat rooms” (another spatial reference) as well as weird artifacts like Apple eWorld that tried to represent connectivity as a traditional community – with buildings corresponding to different tasks – rather than one giant medium (“the Internet”). Even early browsers like Mosaic and Netscape Navigator had names that were spatial, representing a physical collection of objects and a guide through a cyber-landscape, respectively. None of these modes of connectivity were strange in the 1990s. My favorite example in this mold was the Sierra On-Line adventure game “Space Quest 6: The Spinal Frontier” (hereafter “SQ6”), released, crucially, in 1995, which was the year that Netscape really began to pick up steam and Windows 95 was released. It was also, if I recall correctly, the first year I actually went online. SQ6, like its predecessors and most of Sierra On-Line’s games, was a point-and-click adventure, a genre that involves investigating a world, clicking on things, accumulating inventory, talking to people, and solving puzzles. Generally, the gameplay is slow-paced and intellectual. I grew up with these games in the early 90s, installing them from floppy disks, being stumped for hours on puzzles, and then having to order a hint book since GameFAQs didn’t exist yet. Many of them also had manuals that contained crucial, proprietary hints to puzzles, as a means of copy protection. “Space Quest V: The Next Mutation,” for instance, had a tabloid that included important tips. With SQ6, there was a pack-in magazine called “Popular Janitronics” that you absolutely had to have to complete one of the game’s hardest tasks (creating a homing beacon). Unlike, say, “King Quest’s VI: Heir Today, Gone Tomorrow” (also from Sierra), SQ6 wasn’t on the technological cutting-edge, although I thought it was at the time since it was the first “Space Quest” game to be built for CD-ROM distribution (to get a sense of how big a deal this was: KQ6 was initially available on 12 floppies, and, after a year, on 1 CD). Its graphics were ok and its gameplay standard. These screenshots show how a lot of people in 1995 conceived of “the Internet” (which didn’t really have that label at this time; that noun with the definite article is found nowhere in the game’s dialogue or literature): vast spaces, dotted with highways that carried information and ran past virtual buildings that held online accounts and files. The file cabinet screen grab above is accessed through a menu that looks like a dead-ringer for Windows 3.1, which is itself housed inside a trailer. That’s about as cyberspace-in-early-1995 as you can get, and not far off from eWorld, albeit in a Windows-centric universe (I played the game on a Windows 95 machine). He’s asking good questions, and I can’t wait for him to write more books on “the Internet” and its history. Since we’re talking about video games here, though, I might note, on the subject of “origin stories,” that this tendency toward a specific, linear history of “the Internet” – one that scrubs out various continuity errors or false starts – is a lot like something from a comic book or fictional universe, which makes sense. The tech industry at present has considerable overlap with geek culture, which has led it to elevate the Maker movement and the sort of artifact-obsessed outlook that loves clean origin stories rather than messy human dramas. Roger Wilco never starred in another official SQ after 1995. Like the rest of Sierra’s adventure gaming franchises, which had thrived as PCs became mainstream in the 1980s and 1990s, it struggled to keep pace with new types of games that sported better graphics, more violence, and online gameplay. The solo, introverted experience of the point-and-click game was no match for attention spans with access to Unreal Tournament and, eventually, Facebook games. With that transition in mind, it makes sense that SQ6 would see “the Internet” as a bunch of filing cabinets, or an “offline” version of Windows 3.1, for someone to dig through. The notion of the Internet as an actual medium for other people’s information, rather than a quiet library for each individual, implies a broad social connection that computers did not deliver in the mid 1990s and further back. It’s too bad, in a way. If the Internet were conceived of a space today, think of the impact such a mindset might have on data collection and privacy – Wilco would have been overwhelmed had he stumbled across the “F” filing cabinet in that building, stuffed as it would be now with Facebook data. Or the “N” (NSA) or “U” (Uber) cabinets. Maybe it’s time to bring “cyberspace” back, if only as a semantic nod to there being real consequences for data collection and online screeds.